(Rating applicable when exposed on either face except as noted in Item 8). 1. Supporting Angles — 3 by 3 by 1/4 in. steel attached to masonry with expansion shield and 1/4 in. by 2 in. long steel bolts spaced 24 in. OC. 2. Flashing Angle — 2 by 3 in. 24 MSG coated steel, 2 in. leg attached to masonry with No. 14 by 1-1/2 in. long self-tapping steel screws with steel and neoprene washers in 1-1/2 in. long split steel inserts spaced 18 in. OC. 3. Wall and Partition Facings and Accessories* — Steel Liners — min 24 MSG 12 and 24 in. wide steel liners forming the interior side of the wall, attached to top and bottom supporting angles with No. 12 by 3/4 in. long hex-head, self-tapping steel screws located 1 in. from the edge of liner and not greater than 12 in. OC. The side wall flashings is attached to liner with 1/8 in. diameter stainless steel pop rivets or No. 12 by 1 in. long screws at 18 in. OC. Adjacent liners fastened together with No. 12-1 in. hex-washer-head self-drilling screws or No. 14 by 3/4 in. hex-washer-head self-tapping screws through lips and spaced 5 ft OC. max vertically. CENTRIA, A DIVISION OF NCI GROUP, INC — Types CFP III, L1 Liner, L1-2 Liner, L2 Liner, L2-2 Liner, L-10, L-10P, L-11, L-11P, L-20, L-20P, L-21, L-21P, L-36, L-36P, L-41, L-41P, Trimwall, L2-3 Liner. METAL SALES MANUFACTURING CORPORATION — Types TL-19A, TL-19B, TL-20, TL-21, TL-17, TL-18. 4. Sub-girts — Hat shaped, min 1/2 in. deep by 3-1/2 wide with min 5/8 in. wide legs, 18 MSG galv steel attached to lip of liner with one No. 12 by 1 in. hex-washer-head, self-drilling, self-tapping screw or one No. 14 by 3/4 in. hex-washer-head self-tapping screw located alternately along the upper and lower legs. Maximum sub-girt spacing 48 in. OC with top and bottom girts located not more than 3 in. from supporting angles (Item 1). 5. Batts and Blankets* (Optional) — 24 by 48 by 1-1/2 in. thick mineral wool or glass fiber batts. 5A. Fiber, Sprayed* — As an alternate to Batts and Blankets (Item 5) — (100% Borate Formulation) — Spray applied cellulose material. The fiber is applied with water to completely fill the enclosed cavity in accordance with the application instructions supplied with the product with a nominal dry density of 2.7 lb/ft3. Alternate Application Method: The fiber is applied without water or adhesive at a nominal dry density of 3.5 lb/ft3, in accordance with the application instructions supplied with the product. 5B. Fiber, Sprayed* — As an alternate to Batts and Blankets (Item 5) and Item 5A - Spray applied cellulose insulation material. The fiber is applied with water to interior surfaces in accordance with the application instructions supplied with the product. Applied to completely fill the enclosed cavity. Minimum dry density of 4.3 pounds per cubic ft.
5C. Fiber, Sprayed* — As an alternate to Batts and Blankets (Item 5) - Spray applied cellulose fiber. The fiber is applied with water to completely fill the enclosed cavity in accordance with the application instructions supplied with the product. The minimum dry density shall be 4.30 lbs/ft3. 6. Gypsum Board* — Any 5/8 in. thick UL Classified Gypsum Board that is eligible for use in Design Nos. L501, G512 or U305. Nom. 5/8 in. thick by 48 in. wide sheets, three layers applied vertically. 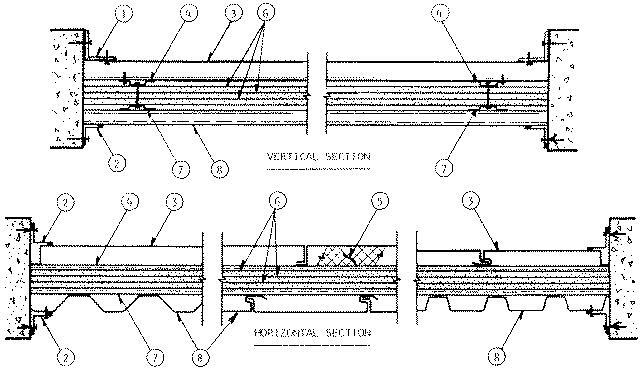 Vertical and horizontal joints between adjacent layers staggered. First and second layers attached to sub-girts with No. 6 by 1-5/8 in. long self-drilling, self-tapping Phillips bugle head steel screws located alternately 12 in. from vertical edges in each sheet for the first layer and 6 in. from vertical edges for the second layer. Second layer screw attached with No. 10 by 1-1/2 in. long double lead wallboard steel screws spaced 24 in. OC along the edges of each sheet.Third layer attached to first and second with No. 10 by 1-1/2 in. long double lead Phillips bugle head steel screw spaced 24 in. OC vertically and 6 inches from edge. 7. Sub-girt — Hat shaped, min 1/2 in. deep by 3-1/2 wide, with min 5/8 in. wide legs, 18 MSG galvanized steel placed over wallboard and attached through the wall board to the first set of sub-girts with No. 12 by 3 in. long self-drilling, self-tapping steel screws spaced 24 in. OC. 8. Wall and Partition Facings and Accessories*— Facing Units — Fabricated from steel or aluminum in various shapes. Min thickness of aluminum 0.032 in. Min thickness of steel, when assembly is exposed to fire on either side, is 24 MSG. Shapes supplied in 12, 30 and 36 in. widths attached to sub-girt with one No. 14-3/4 long hex-washer-head self-tapping or No. 12 by 1 in. long hex-washer-head self-drilling, self-tapping screw at each joint. For units exceeding 12 in. in width, additional screws are necessary to allow a maximum spacing of 14.4 in. OC along sub-girts. Exposed fasteners require a steel and neoprene sealing washer. Overlap joints require No. 12 by 3/4 in. long hex-washer-head self-tapping stitch screws at 24 in. OC vertically. Flashing angle attached to face panel with 1/8 in. diameter steel pop rivets or No. 12 by 3/4 in. long hex-washer-head self-tapping screws at 12 in. OC vertically. AEP SPAN, DIV OF ASC PROFILES — Type HR-36. CENTRIA, A DIVISION OF NCI GROUP, INC — Types Channelwall I, Channelwall IV, Channelwall VI, Trimwall, Wedgewall, Featurewall, Contour wall, Shadowall, Ribwall, Hilinewall, V-Rib, Modified V-Rib, 9/16 in. and 7/8 in. by 2.67 corrugated, 4 in. Ribbed and 8 in. Rib Line, Dynaspan, Style Rib, 1/2 in. Econolap, 3/4 in. Econolap, Box Rib, CFP II, CFP III, Hi Rib, HR-35, Modified V Beam, Super Rib, V Beam, IW10A, IW11A, IW13A, IW18A, IW20A, IW21A, IW30A, IW31A, IW40A, IW41A, Sections 3, 12 or 30, C15-40, HR5-36, BR5-36, MR3-36, LR4-36, TR4-36, Corrugated, Strudi-Rib, Huski-Rib, Box-Rib, Magna-Rib, SR3-36, IW14A, IW60A, or, K-Panel, CS-200, CS-200E, CS-210, CS-210E, CS-220, CS-220E, CS-260, CS-260E, CS-610, CS-610E, CS-620, CS-620E, CS-630, CS-630E, CS-660, CS-660E, CC-260, CC-262, CC-263, CC-624, CC-662, CC-663, CC-664. METAL SALES MANUFACTURING CORPORATION — Types T-2, T-3, T-4, T-5, T-6, T-6A, T-7, T-7A, T-8, T-8 Modified, T-9, T-11, T-12, T-10A, T-10B, T-10C, T-10D, T-10E, TL17, TL-17A, TL-17B, TL-17C, TL-17D, TL-18, TL-1222, TL-1251, TDR-6, TDR-9, TDR-12, T-13, T-14, T-15, T-23, T-24, T-25, T-26, B-Type, and B-Type Modified.